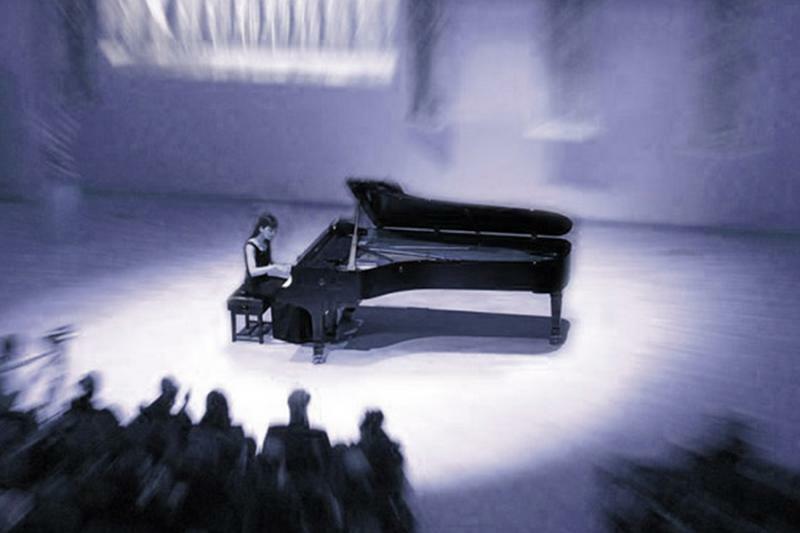 Pianist Tara Kamangar has been praised as a "huge talent" (London Evening Standard) and a "world-class musician who excels at blending the best of Western and Middle-Eastern compositions" (Gulf News). With a diverse repertoire ranging from Bach to Behzad Ranjbaran, Tara brings audiences rarely heard works by Iranian composers of the past century. Her recent performance credits have included such venues as London's Cadogan Hall, Wathen Hall, David Josefowitz Recital Hall, at the Whitehall Palace, New York City's Skirball Auditorium, Washington DC's National Gallery of Art and LA's Walt Disney Hall. Born to a musical family, Tara has studied the piano and violin from the age of three. She is an honors graduate of Harvard University, where she received her BA in Anthropology with a specialization in Ethnomusicology, and an honors graduate of London's Royal Academy of Music, where she completed postgraduate studies in piano performance as a recipient of the Kathleen Bayfield scholarship. An unusually versatile musician, her recent recordings and collaborations range from soul singer and The Roots protege Antoniette Costa, to the "Spanish Maestro of the Guitar," Angel Romero. Tara is also featured prominently as a gypsy-jazz violinist on the latest album of the Iranian rock band, Kiosk, named one of the best albums of 2010 by BBC World's World of Music, as well as in the latest album of Mohsen Namjoo, Useless Kisses, in which she performs classical piano selections to the accompaniment of Persian poetry. Tara's debut solo classical album, East of Melancholy: Piano Music from Russia to Iran, will be available shortly. Tara chose to combine her favorite works by composers from Russia, Armenia, Tajikistan and Iran in this album due to the considerable exchange of artistic ideas in this region throughout the centuries. Piano selections by established composers such as Glinka, Rachmaninoff, and Khachaturian, who were often influenced by their ideas of the exotic Orient and by folk music from the Caucasus region, set the stage for rare gems by Iranian composers Aminollah Hossein and Loris Tjeknavorian, which are not as known to the West due to the political turmoil in Iran throughout the past century. Recorded on The Scoring Stage at Skywalker Sound by producer and Grammy® winning engineer Leslie Ann Jones, this album also comes with a strong visual component. It will be released with a series of cutting-edge music videos by Berlin-based director Matthias Heuermann, as well as a short animation by renowned filmmaker Bahman Ghobadi. The 150th birthday of Edvard Grieg, in 1993, was grandly celebrated in his native Norway, which had indeed never forgotten him. The anniversary was a least acknowledged elsewhere, the recording industry being particulary helpful in this respect. 1993 may well have been instrumental (hoary pun intended) in restoring to circulation and a godly measure of respectability such treasures as the composer's Peer Gyn incidental score (with Ibsen's text, rather than the pops concert suites), the Piano Concerto, and the Holdberg Suite for string orchestra. The celebrations, if such they may be called, may have resurrected additional pieces outside Scandinavia, but such superb works as the Lyric Pieces for piano and the Norwegian Dances and Sigurd Jorsalfar for orchestra, and the stunning operatic fragment Olav Tryggvason, as well as the once-"standard" Elegiac Pieces remain absent from the international repertoire. Our loss. The Concerto is launched by those familiar chords, the piano's octaves sweeping the keyboard from top to bottom, then ascending again in giant arpeggios. It's certainly an attention-grabbing opening, but also somewhat of a red herring (Nordic-waters pun unintentional), as is the case with another concerto everyone supposely knows, Tchaikovsky's First. Grieg's opening gives the mistaken impression that heaven-stroming is to be the movement's preoccupation, when, in fact, a tender lyricism prevails, starting with the subsquent main theme (as in the Tchaikovsky, the opening passages are merely introductory material), announced by the woodwinds and taken up by the soloist. But the killer-tune - a supreme example of the composer's melodic inventiveness - is the bittersweet second theme. Liszt, a strong supporter of the young Greig, suggested that it be announced by solo trumpet, advice that Greig eagerly accepted. And so it appeared in the first published edition (1872). Subsequently, however, Greig, who knew from a start a thing or two about orchestration (Liszt knew only a thing), changed it to the version now heard, the theme announced by the cellos. A mellow masterstroke, as it turned out. Movement two begins with a gentle, folklike melody sung by the muted strings, whereupon the piano enters with its own, seperate theme. High register piano thrills usher in, without pause, the finale which, after some virtuoso brilliance, settles into the kind of theme Greig did best: an exquisitely simple-seeming inspiration, purely Norwegian in its meldoic cast, yet laid out for fingers on a piano by a hand that knew, and revered, Chopin. The emtional turbulence of Tchaikovsky's mature masterpieces often suggests a confessional quality around which it's tempting to construct a narrative. Compounding this tendency is the simple fact that Tchaikovsky was a particular favorite in the early days of radio and the recording industry. This is when classical music was first becoming available to a mass audience, and such narratives abounded as a strategy for making sure the music didn't seem forbidding. Nowaday's it's with bemused detachment that we come across the impossibly flowery commentaries (quite apart from Tchaikovsky's own descriptions) to which the composer was subjected. They're of the stereotypical "fickle finger of fate" variety, where melodies chastly pick themeselves up despite bruised wings to soar aloft, newly armed for spiritual victory. Tchaikovksy's popularity as a source for Hollywood scores and TIn Pan Alley tunes of that period is hardly coincidental. The first movement - around twice the length of each of the other three - immediately ushers us into a world of bleak despair that attains a crushing intensity. Tchaikovsky employs the mastery of his techincal skill to give his emotional power resilient shape. He manages his tradtional orchestral forces in unexpected ways, with brass chorales as rousing as Judgement Day and delicately sprung wind solos. Even the composer's trademark roulades possess a shattering, nervous energy that seems unique here. Two inner movements of entirely different character turn out to be interludes rather than actaul shifts of direction. The second movement's flowing, dance-like charm is given a subtle displacement through the use of 5/4 meter (two beats followed by the triple pattern of the waltz). In the third movement, Tchaikovsky presents a blazing but hollowly triumphant, brass-reinforced march that revels in aggressive, swaggering rhythms. It's often been pointed out that had Tchaikovsky simply switched the order of the final two movements, he would have preserved the optimistic, Beethovenian model of light over darkness. Yet by reversing that model and ending with the nihilistic, dying fall of the Adaglo (the same tempo with which the Symphony began), he introduces a radically new concept of the sumphonic journey (Mahler's NInth would follow a similar pattern). Indeed, Tchaikovsky writes about his novel approcach to form here as an aspect that excited his creative fancy. The valedictory plunge into silence from a sustained B-minor chord deep in the strings sets the stage for a new century of bleak requiems. Tchaikovsky declared that he had put his "whole soul into his work." And there it remains - beyond all attempts at reductive explanations - for us to encounter anew.